A Target diagram is a fantastic way of getting students to break down a key question. Three factors are placed in the centre of the diagram. In the next layer, each factor can then be broken into two examples. In the final layer, each of these examples can then be substantiated with factual detail / illustrative points. A great way of planning an essay! Provide students with a key question, for example "What were the effects of World War One?" Students are asked to come up with three broad categories that could be used as the basis for the investigation, e.g. Social / Political / Economic. These are written into the central area. a. Give each student a number (1, 2 or 3) corresponding to one of the three categories. b. Each student has a few minutes to come up with two key examples to illustrate their allocated category of factor. c. All the number "1"s sit together and compare their ideas, as do the "2"s and "3"s.
d. Each group decides what the two best points are to keep. The teacher then asks each group to feedback with their findings. These are recorded in the middle layer of the diagram. Finally, the students are asked to fill in the final layer of the diagram themselves with substantiating detail for each of the 6 examples now identified. They could do this in groups and feedback to the class again. Alternatively, the teacher could save the template onto the network so that students can open it up and work on it individually, or print off copies so that they can be completed by hand. 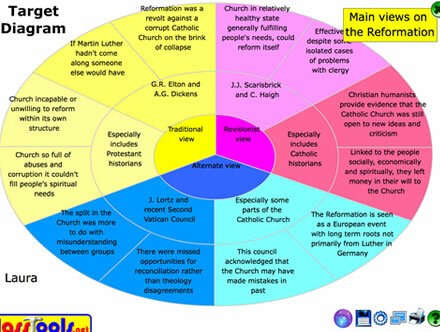 The teacher could complete one segment of the diagram (Social, Political or Economic) in advance of the lesson to give students a clearer idea of what needs to be done with the remaining two sections. Students could write an essay based around the key question using their template as the basis as their central three paragraphs. 2 How true is this movie to the actual book? Find examples in the text to prove your point! 10 How would these thing improve life for inhabitants of Lagos? 13 Add strategies that you use to each aspect. 16 To what extent did the Great Leap Forward allow Mao to maintain authoritarian power? 29 What motivated Martin Luther? 34 Evaluate the impact of Stalinism on the lives of the Soviet people. 36 Injector Chris E. Che J. 39 You will throw a ball an what you hit on the target you will explain as it applies to the area. 43 Create your own target diagram to answer the following questions. 48 Edgar Allen Poe's character traits from: T.B.C, T.C.A, and T.T.H. 49 what do we want secondary school to be like or not to be like!!!!!! 55 To what extent did the Great Leap Forward allow Mao to maintain authoritian power? 59 How healthy was the catholic church? 62 To what extent did the Great Leap Forward allow Mao to maintain authoritarion power? 70 ALWAYS CHECK YOUR WORK! 94 Some ideas - please add your own! 97 Is Macbeth responsible for Duncan's death? 101 To what extent did the Great Leap Forward allow Mao to maintian authoritarian power? 105 Beneficios de la musica para tu salud. 106 What makes a sucessfull business? 117 To what extent did the Great Leap forward allow Mao to to maintain authoritarian power? 124 How did the role of women under Mao change between 1949 and 1976? 133 To what extent did the Great Leap Foreward allow Mao to maintain authoritarian power? 140 To what extent did the Great Leap Forwards allow Mao to maintain authoritarian power? 151 Olvassd el és tájékozódj! 153 You will throw a target at a question. Solve the problem where the target lands. 158 to what extent did the Great Leap Forward alow Mao to maintain authoritarian power? 162 What makes a business successful? 178 Edgar Allan Poe's character traits from: T.B.C, T.C.A, and T.T.H. 191 To what extent did the Great Leap Forward allow Mao to maintain authoritarian power?